Please click the underlined words to see the photo. Article: "Season's memory still spurs teammates"
Article: "Son of old Leaksville keeps tale of Wampus Cat alive"
Photo of Joe Thomas Campbell's "Fly Baby"
"Shorty Sims- Go eat a brick! 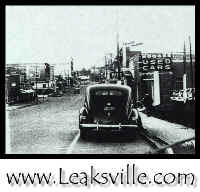 Article: "Having a Leaksville State of Mind"
Book Secrets of Leaksville Lodge #136 by H.C. Pace, Jr. Photos "Farewell to the Hamilton Street Bridge"
Steve Turner and J. T. Hale Jr.
Norma Axsom Zanetti , Ann (Minter) Campbell Gover and John Lloyd Axsom, Jr.